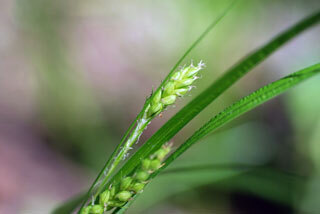 Also Called: Emerson davis' carics sedge. Culms: Erect to loosely ascending, shorter than to longer than leaves, sharply triangular, glabrous or somewhat hairy, purplish at base. Leaves: Blades 1/2 to 16 inches long, 1/6 to 1/3 inch wide, flat, green to dark green, glabrous or usually hairy beneath near base; lowermost leaves reduced to nearly bladeless sheaths. Sheaths: Long, hairy, yellowish-brown on inner surface. Ligules: About as long as wide, U-shaped to broadly V-shaped; inner side thin, white. Inflorescences: Bracts leaf-like; terminal spike stalked, mostly staminate but with few to several pistillate flowers near tip, linear to narrowly oblanceolate in outline, .6 to 1.5 inches long; staminate scales lanceolate, white with green midrib, tip awned; lateral spikes 2-3, short- to long-stalked, pistillate, .8 to 1.6 inches long, 1/8 to 1/4 inch wide, erect when young, usually drooping at maturity; pistillate scales narrowly elliptic-ovate, white or pale green, midrib green, tapering to awn 1/10 to 1/5 inch long, uppermost pistillate scales with awn more than half as long as body of scale; perigynia ovate-lanceolate, 1/6 to 1/4 inch long, broadest below middle, strongly ribbed, pale green to green, tip tapering to short beak with 2 minute teeth. Fruits: Achenes, triangular, 1/10 inch long, yellowish-brown, 1-seeded; stigmas 3. Habitat: Rich deciduous woods, edges of streams and rivers, roadsides, occasionally low meadows. Distribution: Principally east 1/4 of Kansas.